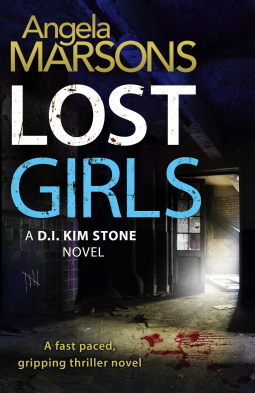 Lost Girls is the third book in the Kim Stone series, I have read both previous books Silent Scream and Evil Games and loved every page of them, so I have been waiting for Angela Marsons lost girls with baited breath, and it’s suffice to say I wasn’t left disappointed, I found it utterly compelling. DI Kim Stone is the lead character in this brilliant series by Angela Marsons, as Kim herself says she’s determined, driven, persistent and stubborn, but in Kim we get more than that, she is a very complex character due to her difficult and abusive upbringing, she doesn’t always follow protocol, she’s feisty and she’s forthright. Kim is such a complex character with so many layers, I feel Angela has done her job really well by given the reader a character that is not only believable but very likeable. From the opening page Lost Girls draws you in and keeps you in its grasp to the very last page. In the epilogue we learn the young girls are already missing and being held captive, and from there on in, the book book builds up momentum. As Kim relentlessly follows one lead after another I found I couldn’t turn the pages fast enough. Considering the subject matter concerns two missing girls, Angela Marsons manages to deal with the subject sensitively, as Lost Girls progresses, the reader learns more about the missing girls parents and you can feel their heartache and torment, as the two families are pitted against each other in order to save their child. As the Lost girls reaches its climax I really was on the edge of my seat, as Angela tided up loose ends and the kidnappers were revealed I was left speechless! I felt like I had been on a super fast roller coaster ride, there were that many twists and turns. The chapters in Lost girls are short and precise, but each one is packed with tension and suspense, and as each chapter ends you just have to “read one more”. It’s a cliche I know, but Lost Girls kept me up late into the night as I just couldn’t bear to put it down. Angela Marsons has written a tightly woven thriller, that will keep the reader riveted to the last page. Well done to Angela Marsons for writing such a fantastic book, and I for one can’t wait for the next one. I also hope the relationship between Kim and Matt Ward the negotiator will be explored further, they seem perfect for each other. Thank you to NetGalley and the publishers Bookouture for my advanced copy in exchange for an honest review. This entry was posted in Angela Marsons and tagged Crime Thriller on October 31, 2015 by lollyrugs.